alternative livestock feed | . :Rocky Hollow Gardens:. Well since activating our greenhouse straw bales yesterday the top 6 inches of the bales are showing a temp of 110°F! Bales beneath the fodder trays is reading 110 degrees F! When I went out this morning the windows were all fogged up on the inside. So our activated straw bales are becoming a great heat source as the nights get cooler. A picture taken from right outside the door. 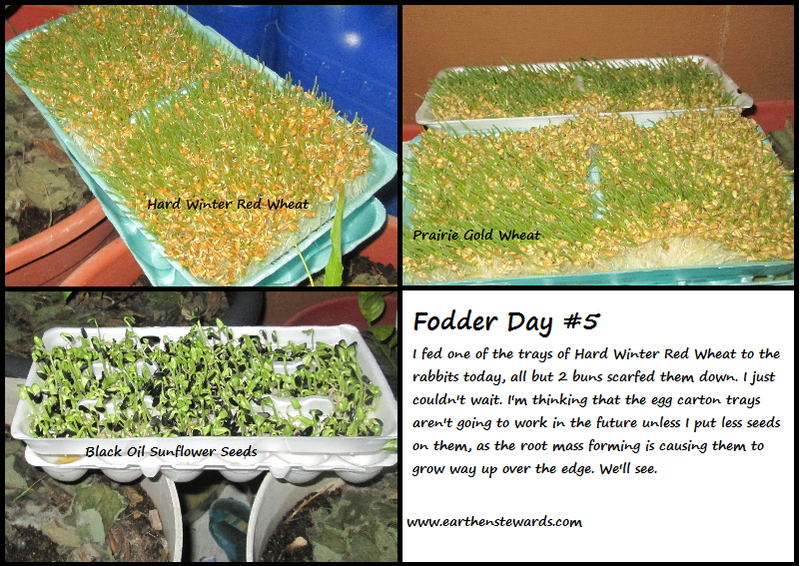 I’m learning a lot as I experiment with growing my own fodder. Since I started this, I’ve been soaking the seeds over night, and pouring them into the fodder trays the next day to let them sprout. But since then have been experiencing the top layer of seeds drying out and not sprouting. After looking at other blogs and reading more info I realize I have been making a mistake in putting them in fodder trays the next day. The sprouts should stay in a “sprouting bucket” for 3-4 days before putting them in the fodder tray, to ensure more of the seeds stay wet enough to develop the roots needed to continue to grow correctly. Live and learn. I’ve been reading several different blogs on Fodder today and see that many homesteaders are getting off pellets and store bought feeds all together and feeding 90% fodder, and the remaining 10% consisting of hay, black oil sunflower seeds and a salt lick. I am inspired to also make this transition, as it will greatly lessen our feed costs for our rabbit herd and our flock of chickens. Chickens can be raised on fodder, grit and calcium like oyster shells. For the chickens I’ve begun fermenting their regular crumble feed, as I’ve been reading that this makes more nutrients available to digest and improves the health and egg laying ability of the flock.